The day started with a warning from Roger, the Captain, about water - or rather the lack of it. We are using more water than we can make. So, with no way of taking on water until we reach Jamaica, we have to save it. The message was clear: conserve water or cut short the science. And the latter is not an option! Flying at a few hundred metres above the ocean bottom, TOBI has been in action for more than 36 hours and producing some interesting results so far. 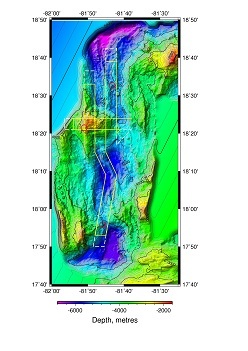 The maps below show where we are and the area we are studying: an area about 60 miles long and 20 miles wide. The lines on the map show the TOBI survey route. Mid-ocean ridges occur where the tectonic plates are being pulled apart. 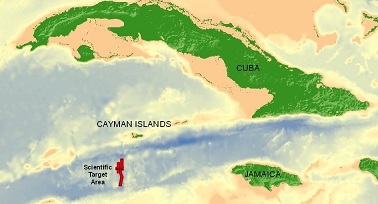 The Mid-Cayman Spreading Centre (MCSC), which is ridge that we are exploring, is the world's deepest. And we are the first to map this area in detail. We cannot rely on the existing maps for this area, as one of today�s watches found when TOBI had a close shave with the seafloor. 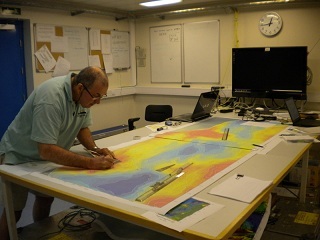 At 2000 hours GMT, the watch made their usual half-hourly checks, noting that TOBI was 800 metres above the seafloor. But within 30 minutes it was only 400 metres above the bottom, as TOBI approached a steep undersea volcano not shown on any maps. Quick action was needed - the watch asked the Bridge to speed up the ship, and started to haul in TOBI�s umbilical cable with the winch. Fifteen minutes later TOBI cleared the peak of the newly-discovered volcano with just 15 metres to spare. This was a close encounter for TOBI, but exactly its job: to build up a clear picture of the undersea terrain before sending out Autosub6000 or HyBIS. The geologists, Roger, Nick and Nancy are already interested in this first view of the ridge, particularly as the data from TOBI show unexpected features such as young underwater volcanoes.